The recent heavy rain has caused the dirt around 50 graves at the Hawaii State Veterans Cemetery to collapse, which has been a problem at the Kaneohe facility since it was built in 1991. 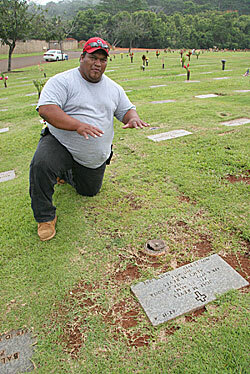 Herring Kalua Jr., general labor supervisor, shows a grave site that was slightly sinking in 2005. Recent heavy rain has caused the dirt around and atop 50 graves at the Hawaii State Veterans Cemetery to collapse -- a constant problem since the cemetery was built in 1991. Four years ago, conditions at the only state-run cemetery for veterans on Oahu deteriorated to the point that parts of caskets were exposed by the sinking dirt. In 2005 the state Legislature appropriated $751,000 to repair some of the conditions in the 123-acre graveyard. Mark Moses, director of the state Office of Veterans Services, which operates the Kaneohe cemetery, said he is saddened by the problems. "Most of the sinking has taken place in three sections," Moses said, "where there are brand-new graves or where there was digging at older graves to add a new casket." "The cemetery looked good until the rains came." Past soil studies disclosed that the soil is not the best type for a cemetery because "it was too expansive," Moses said. "So after a new grave was dug, new soil was brought in to cover the grave." Moses said there also are plans to place caskets in burial vaults using plastic material able to withstand 5,000 pounds of pressure per square inch. "These are the same type of burial vaults used at Punchbowl (the National Cemetery of the Pacific)," Moses added. There are more than 5,000 grave sites at the Kaneohe state cemetery where caskets and urns are buried. The state spent an additional $50,000 to pay for borings to see if Kawa Stream, which flows under the cemetery, was causing some of the sinking of the grave sites.